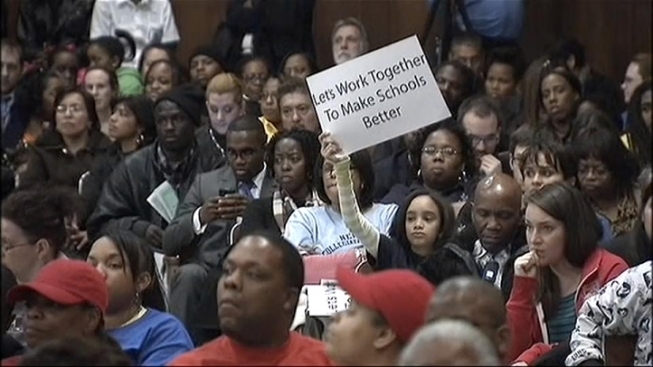 Parents in Newark, N.J., were fired up Tuesday night over a proposal to move charter schools into district public school buildings. Called co-location, the plan drew hundreds of parents, students and teachers to an advisory board meeting at Barringer High School. "We have before us a tale of two school systems," said Newark Teachers Union President Joseph Del Grasso. He referred to the Charles Dickens classic tale because many parents and teachers fear that moving charter schools into existing school buildings will make public students second-class citizens. Charter schools can seek and accept private money, therefore offering more amenities, whereas district schools cannot. "Charter schools ... should not be barter schools that bargain for space in our schools ... at the expense of our children in our community," said Del Grosso as the crowd erupted in applause. But the State Education Department says schools currently being considered for co-location are under-utilized. Acting schools Commissioner Chris Cerf said charter schools receive 75 percent of the money that district schools do and none of this funding pays for facility expenses. "It simply makes no sense for some Newark public school buildings to sit half-empty while public charter schools are forced to use their scarce operating dollars to seek and pay for private facilities," said Cerf. Parents who back charter schools say they are the only opportunities for many to receive a quality education in a school system that has historically failed -- and is currently under state control. Shaquille Grisham Finch is glad to be sending her children to charter schools. "It is about choices ...every child deserves the opportunity to attend a great public school,” she said. Parent Boyette Johnson says that battling over space helps none of the children in the system. "Space has never been a reason to fight,” she said. “Your child not getting a good education, that's a reason to fight."